Why Your Baby Hates Diaper Changes? Does your infant wail and scream each time you try to change their diaper? Crying is usually a signal to the fact that the diaper of your baby is poopy or wet but you may be left wondering why they cry when you change their diapers and in what way you can comfort them while changing diapers. In this article, various reasons as to why your baby cries while you change their diapers will be discussed along with the ways to keep them happy during that time. Cold: Many babies, particularly newborns hate the cold temperature that accompanies a diaper changing session. Hunger: In case you change the diaper of your baby before feeding them, they may be too hungry and can’t wait for their feeding session. In such cases, you should try changing diapers after feeding them. Babies are not aware of the proceedings: Some newborn babies hate changing of diapers because they are not aware of the proceedings. With time, trust builds up and they start becoming familiar with the routine of changing of diapers. Babies want to be in control of their time and body: As your infant becomes older, they want to be in control of their time and body and they don’t want to get a diaper change while they are in the middle of play. It prevents their newfound skills: Why your baby hates diaper changes? While you lay your infant on their back to change their diaper, it prevents them from using and exploring their newfound skills such as sitting, crawling, rolling, etc. and they may not like themselves to be restricted. Acid Reflux: In case your baby vomits, spits up or cries excessively after or during feedings, they may suffer from GERD or acid reflux. 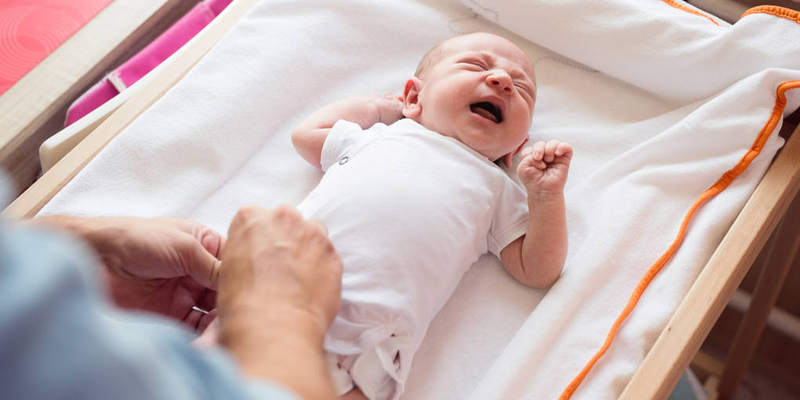 In case you are changing the diaper of your baby after feeding them, the stomach contents may regurgitate into their esophagus causing discomfort and pain. Spina Bifida: It is congenital anomaly, in which the backbone of your baby is not developed normally resulting in nerve and spinal damage. This results in discomfort when baby is laid on their back. This condition is usually diagnosed during birth or before birth; however, your physician may recommend a CT or MRI to diagnose spina bifida in an older baby. In case you think that your baby’s diaper changing fussiness is caused due to a medical issue, visit your physician immediately. After discussing why your baby hates diaper changes, let’s discuss how to deal with the problem. Make diaper changing a ritual: The position of baby and parent while changing a diaper is perfect to create a bond between them. Moreover, this happens multiple times during the day so you get some moments to make quite connection with the baby. Learn about your infant: Diaper change is a perfect opportunity when you can absorb your infant’s signals and cues. As you move, lift and touch them, your hands learn their body’s map and what’s normal or abnormal for them. This will help you to decipher any changes in their body that require attention. Develop trust: Regular changes of diapers create rhythm in the world of your baby and make them aware that their world is dependable and safe. Your loving and gentle care and touches teaches them they are respected and valued. Learn experience for the baby: While changing diaper your baby learns a lot. It is among the times when they see their bodies without any clothes. It is an excellent chance for them to stretch their limbs and learn to move them. During this time, they are also an audience to what and how you are talking to them and it forms an important part of their language development process. Similarly, you are an audience to what and how they are saying; this forms a crucial part of your relationship. What the baby feels and thinks: Many babies who are active don’t care about the cleanliness of their diapers. It is not a priority for them. Uncomfortable diapers (bad fit or wrong size) or diaper rash may be the reason why your baby hates diaper changes so rule out these first. Once all these issues are ruled out, make certain adjustments in the process so that it is more enjoyable. Have some amount of fun: Sing songs, play and do tickle. Some amount of fun may make diaper changing enjoyable for both you and your baby. Keep your baby warm: Change the diaper of your infant in the area of the house that is the warmest or swaddle their upper body. Warm air may also be blown into the chest of your baby while changing their diaper or purchase a wipe warmer. Speak to your baby about your actions: Talk to your baby calmly and tell them exactly about your actions while you are doing it. Make sure that you make eye contact with them while talking to them. This helps in setting a positive tone and your baby will feel respected. Create a lovely view: While changing diapers create a view that is lovely and serene. You may place the changing table near a window or hang your mobile over their changing pad. You may also get a mural painted on a wall nearby. Take few deep breaths: Since you have to change the diapers so many times in a day, it may become a routine task or even a hassle for you. When it becomes routine for you, then it is not enjoyed by your baby either. Try to make diaper changing as a bonding experience with your baby when you can have some moments of calm and peaceful time with your baby. Use some distraction: You can give your baby a flashlight and let them play with it during the time you are changing their diaper. You may also keep a basket full of small interesting toys only for diaper changing time and give them to your baby to play while you are changing them. Try using stand-up diaper: In case the diaper of your baby is only wet, try changing them while they are standing up. For cloth diapers, you can pre-pin one leg so that you may slide it like pants. You may also use pre-fitted diapers, which don’t need pins. Consider doing potty training: In case your baby has become old enough and is ready for next step, you may consider doing their potty training.